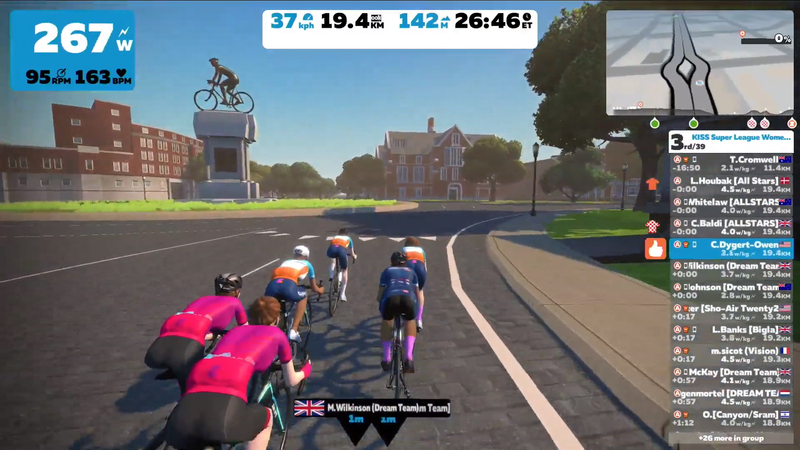 Round Four of the women’s KISS Super League ended in a dramatic showdown between one pro team racer and one Zwift Community All-Star. This week, riders raced on a replica of the 2015 UCI Road World Championships course in Richmond, Virginia. They rode two laps, each one starting flat and fast and ending in a series of 3 climbs that give little chance for recovery. The first of these is Libby Hill, which is 630 meters with an average 6.2% grade. Almost immediately after that—another climb with 260 meters but an average grade of 10.2%. Top racers often hit this with a full sprint. Finally, after a short break, a 1-kilometer climb at an average of 5% leads right into a false flat finish. The first part of the lap focused on the intermediate sprint competition. Racers could win points toward a prize for being among the first to cross the sprint banners. 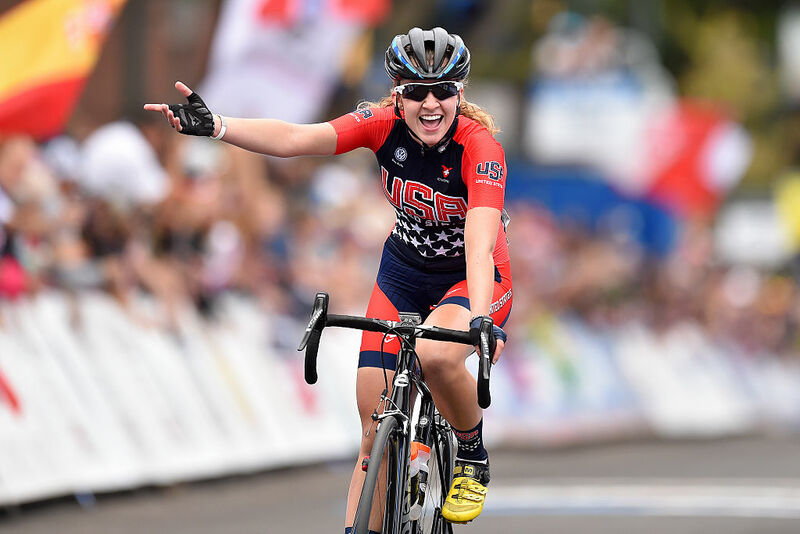 They also battled for a Queen of the Mountains (QOM) competition, which awarded points at the top of Libby Hill and 23rd Street. In order to get the most sprint or QOM points, though, riders needed to survive the test ahead and get to the second lap. That wasn’t going to be easy. Cassie Baldi (Zwift All Stars) charged onto Libby Hill, breaking away from the group before they even turned onto the cobblestones. The line of racers snaked its way up Libby Hill and began to pull apart. They tried to reconnect at the top. Before they got a chance to recover, though, they had to get up the steep ramp of 23rd Street. Only 6 riders remained after this one-two punch. Baldi, Louise Houbak, and Vicki Whitelaw represented the Zwift All Stars. 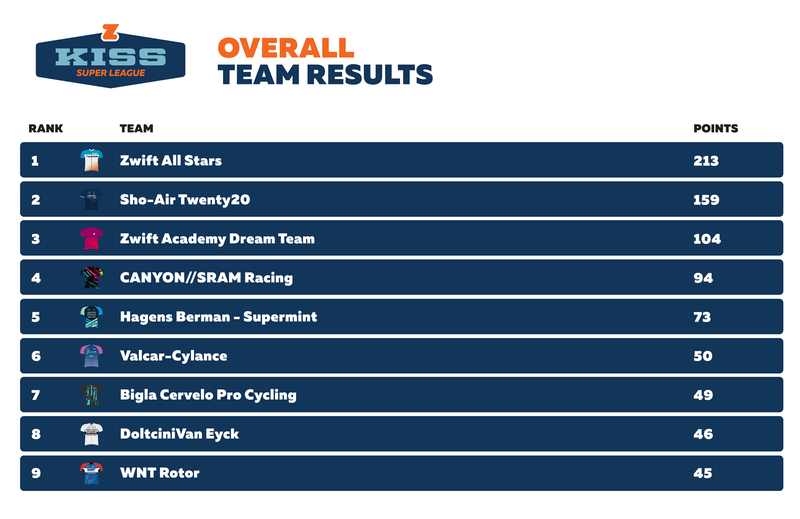 The Zwift Academy Dream Team had Mary Wilkinson and Ione Johnson. And Chloé Dygert Owen was the sole rider from Sho-Air Twenty20. They all made it up Governor’s Street together, and now they had to do it all again. The 6 leaders kept riding hard to make sure they stayed ahead. A strong chasing group of 3 riders was just 20 seconds behind them before the first sprint banner. 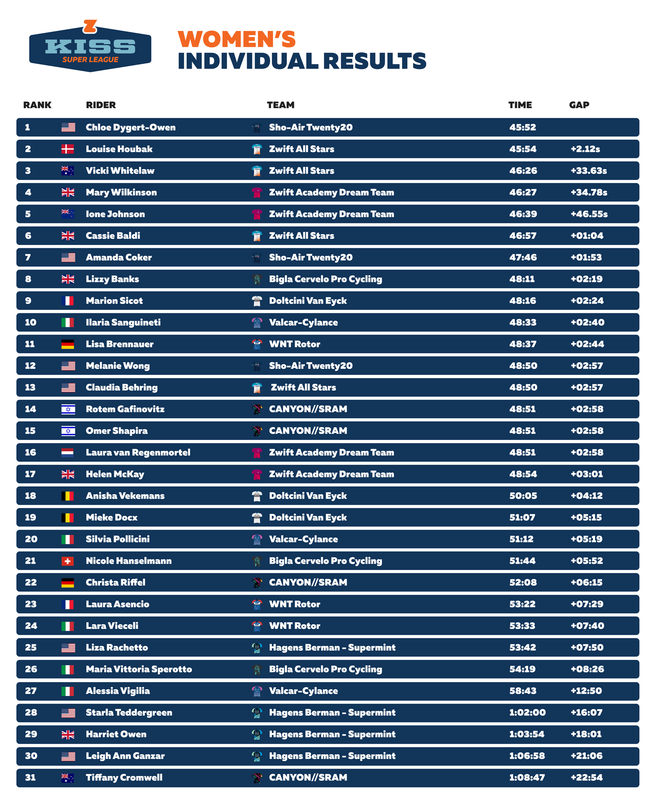 Chasers Marion Sicot (Doltcini Van Eyck), Lizzy Banks (Bigla Cervelo Pro Cycling), and Amanda Coker (Sho-Air Twenty20) were trying to make contact. Slowly, the front group’s lead stretched out to more than a minute. This time, Houbak led the way up Libby Hill. Her teammate Whitelaw followed, along with Wilkinson and Dygert Owen. Johnson and Baldi couldn’t hang on. On the steep 23rd Street climb, Houbak pulled out a one-second gap on the others. Dygert Owen clawed her way up to the leader, and the two joined at the top. It was down to one racer each from the Zwift All Stars and Sho-Air Twenty20. 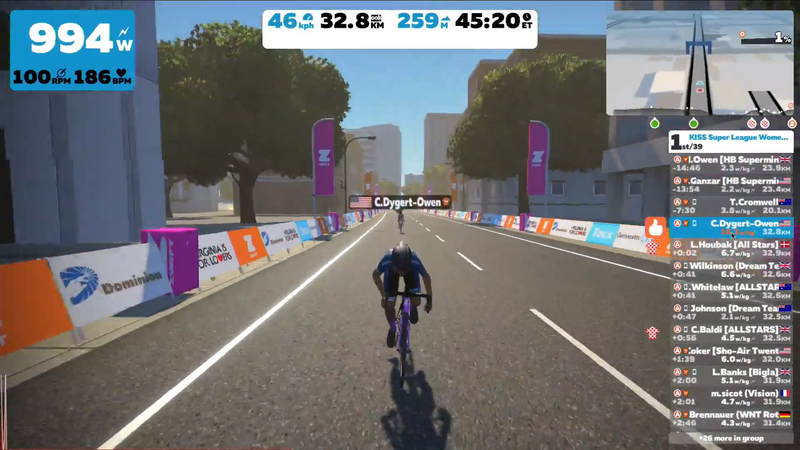 Houbak, the winner of Round One, is the Danish Zwift National Champion and a strong racer on the road. But she had a very tough challenger in Dygert Owen, multi-time World Champion in the Individual Pursuit and Team Pursuit on the track. On the final Governor’s Street climb, Dygert Owen dropped a feather PowerUp and attacked– but Houbak was right on her wheel. The Sho-Air rider wasn’t giving up. Dygert Owen attacked again near top of the hill and dug in for an all-out push to the line. Houbak started to reel her in, using an aero helmet PowerUp as she sprinted, but she couldn’t reach her. Dygert Owen took Sho-Air Twenty20’s second win! This isn’t the first time Dygert Owen has taken a victory in Richmond. In 2015, she won both the Junior Road and Junior Time Trial Championships on the real roads in Virginia. She said she had used Zwift for interval workouts but not much else. She called on a friend with more experience with indoor trainers and software, who helped her set things up and hit the PowerUp button. “I was super stressed about it, but now it’s fun! I wouldn’t mind doing it again,” she said. The live broadcast showed Dygert Owen disappearing and reappearing on the final lap. The race looked normal on her own screen, though, and she could see both herself and the other racers. Houbak said she did her best to catch Dygert Owen, but her opponent was just too strong. The Zwift All Star said she’s proud of the way her team raced today, placing all four riders in the top 13. Don’t miss any of the action. Tune in live! Please note: Race times have changed in the U.S. due to Daylight Saving Time. Men’s KISS Super League: Every Wednesday at 12 pm PST. From Jan 23rd to Mar 27th. Women’s KISS Super League: Every Tuesday at 12 pm PST. From Feb 19th to Apr 9th. 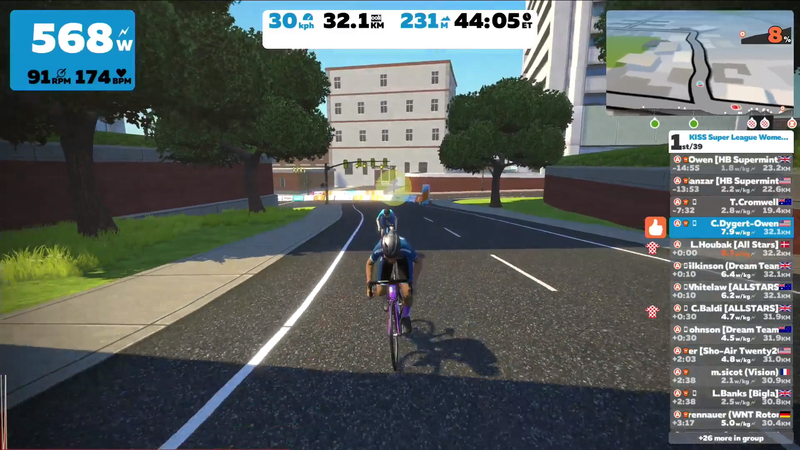 For weekly schedule, routes and standings, please visit Zwift.com/KISSRacing. ©2019 Zwift Inc, All rights reserved.